In stock -This product will ship today if ordered within the next 27 minutes. 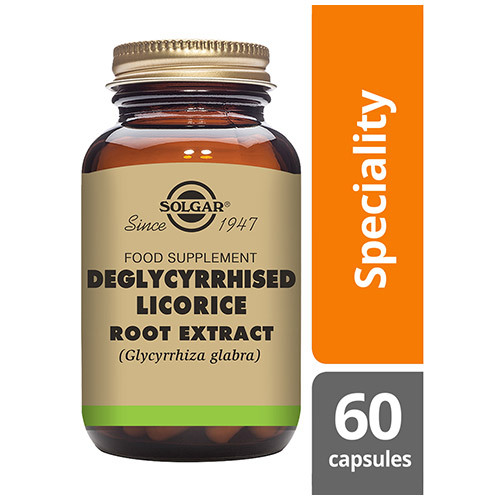 Solgar® Deglycyrrhised Licorice Root Extract contains licorice root and is one of Solgar®’s Botanical range products. Licorice root grows in Europe, the Mediterranean and Asia, having been used for centuries for several purposes. In some countries it is eaten as candy and it has a very strong flavour. The licorice root herb (Glycyrrhiza Glabra) is very complex and contains different compounds. In the deglycyrrhised version of licorice root, the compound triterpenoid glycyrrhizin has been removed. This element is what causes the sweet flavour, but when used in excess it can cause side effects. Solgar® Deglycyrrhised Licorice Root Extract is to be taken as 1-3 vegetable capsules a day, giving you all the benefits of this ancient botanical, without any of the side effects caused by glycyrrhizin. 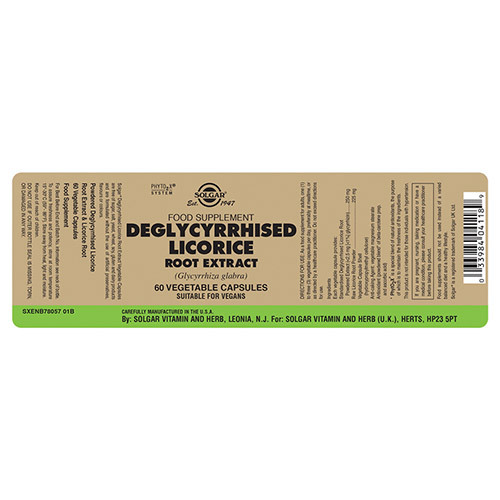 Standardised Deglycyrrhised Licorice Root Powdered Extract (<1% glycyrrhizin), Raw Licorice Root Powder, Vegetable Capsule Shell: hydroxypropylmethyl cellulose, Anti-caking Agent: vegetable magnesium stearate, Antioxidant (powdered blend of beta-carotene prep and ascorbic acid). As a food supplement for adults take one to three vegicaps per day, preferably at mealtime, or as directed by a healthcare practitioner. If you are pregnant, nursing, taking any medications, planning any surgical procedure, pr have any medical condition, please consult your healthcare practitioner before taking this product. 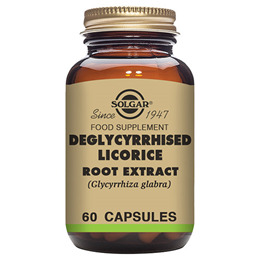 Below are reviews of Solgar Deglycyrrhised Licorice Extract - 60 Vegicaps by bodykind customers. If you have tried this product we'd love to hear what you think so please leave a review.